WESTFIELD — The latest entry in the Futures Collegiate Baseball League unveiled its name and logo on Wednesday night at an event held at the Shortstop Bar and Grill in Westfield. The Westfield Starfires will begin play in the summer of 2019 at Bullens Field in Westfield. The team name pays homage to the city of Westfield’s deep connection with the Air National Guard stationed at Barnes Airport. The name is derived from the Lockheed F-94 Starfire, a first-generation jet aircraft of the U.S. Air Force. The F-94 was the first operational USAF fighter equipped with an afterburner and was the first jet-powered all-weather fighter to enter combat during the Korean War in January 1953. 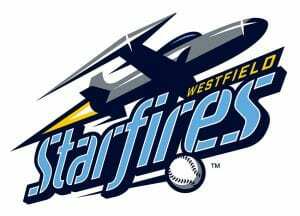 The Westfield Starfires were founded by local entrepreneurs Christopher Thompson and Donald Moorhouse, and are now part of the FCBL’s seven-team circuit. Since 2011, the Futures League has experienced a meteoric rise to become one of the top summer collegiate leagues in the country. Season-ticket packages and merchandise for the new franchise are available now through westfieldstarfires.com. PALMER — Michael’s Party Rentals recently received a national accolade at the 2019 American Rental Assoc. (ARA) annual convention and trade show in Anaheim, Calif. The ARA is the international trade association for equipment-rental businesses and manufacturers and suppliers of rental equipment, with members in every U.S. state, every Canadian province, and more than 30 countries worldwide. Michael’s Party Rentals was acknowledged with a Presidents Image Award from ARA. It was a co-recipient along with True Value Rental of Rollinsford, N.H., representing Region One, which covers all of New England and New York. The honor is given to a business facility or store celebrating its commitment to improving the rental-industry image through a remodeling, rebuilding, or renovation project. The award was in response to Michael’s Party Rentals’ new showroom, which opened in July 2016. HARTFORD, Conn. — United Bank announced that Greenwich Associates, the leading global provider of data, analytics, and insights to the financial-services industry, honored United with its 2018 Greenwich Excellence Awards for Middle Market Banking and Small Business Banking. Specifically, United Bank earned the 2018 Greenwich Excellence Awards for Overall Satisfaction in Middle Market Banking and Overall Satisfaction and Branch Satisfaction in Small Business Banking. Greenwich Associates, after evaluating more than 600 banks, determined that United Bank was among a select number of banks performing at a differentiated level relative to its peers. To qualify for consideration for these national awards, each winning bank had to have a minimum of 50 clients that responded to the survey. In addition, the Small Business Banking accolade was based on more than 14,400 interviews with businesses with sales of $1 million to $10 million across the country. For Middle Market Banking, the ranking was derived from more than 14,400 interviews with businesses with sales of $10 million to $500 million across the country. PITTSFIELD — Pathlight, a local organization that supports people with developmental disabilities and those with autism throughout Western Mass., is moving from its longtime space on North Street in Pittsfield to bigger quarters at 75 South Church St. The move, scheduled for Thursday, Feb. 21, allows Pathlight to better support its programs in the Berkshires. Pathlight’s Autism Connections as well as its Shared Living and Adult Family Care programs are growing in response to community demand. Autism Connections offers workshops, social-skills groups, and support groups, as well as recreation opportunities, to people with autism and their caregivers. The program’s autism specialists also work individually with families in their homes. In Pathlight’s Shared Living and Adult Family Care programs, a community member shares their home and provides support for a person with an intellectual disability or autism. The new office space features a large activity room, several meeting rooms, and a kitchen. The space will host community activities, including education workshops on a host of issues, social-skills groups for people with autism, and support groups for families caring for a person with autism. In the future, Pathlight plans to offer recreational and performing-arts classes for children and teens of all abilities. WARE — Country Bank reported that donations for 2018 exceeded $1 million. Through the bank’s established charitable-giving program, support is provided to local nonprofits throughout the region; in 2018, more than 400 organizations received generous contributions from the program. Among the organizations that received donations, the Salvation Army, the YMCA of Greater Springfield, the Springfield Rescue Mission, Friends of the Homeless, and the USO of Pioneer Valley each received $5,000, while the Food Bank of Western Massachusetts and Christina’s House each received $10,000. The bank also teamed up with Habitat for Humanity to build a home in Springfield last September. Country Bank also has an employee charitable-giving program that raised more than $30,000 in 2018, through events such as jeans days, bake sales, and raffles. WEST SPRINGFIELD — Governors America Corp. has, over the last few years, hired seven past and/or current students from the Lower Pioneer Valley Educational Collaborative’s Career and Technical Education Center (CTEC), a half-day high-school vocational and technical training facility located in West Springfield. CTEC services students from nine communities in and around Hampden and Hampshire counties with 11 program offerings. Governors America Corp. is a leading provider of engine-governing and system controls to manufacturers and power providers worldwide. The new hires mainly come from CTEC’S Machine Technology program and have worked directly on the manufacturing floor, operating computer numerical control machines. CTEC has also provided Governors Corp. with support in its Information Technology department. This mutually beneficial partnership has enabled students to apply the skills that they have learned in one of the area’s premier manufacturing environments and provided Governors Corp. with a reliable source of pre-screened talent that has enriched its staff and production. SPRINGFIELD — The Community Bank N.A. Springfield branch recently celebrated its grand reopening with a ribbon-cutting ceremony. Local dignitaries, customers, community members, and Community Bank N.A. team members gathered to celebrate the completion of the branch’s renovations. Located within Tower Square, the renovated branch will offer Springfield customers enhanced and expanded services, including a 24-hour ATM and a night drop. At the celebration, Community Bank N.A. leaders also announced the results of a community vote between three nonprofits to receive a portion of the bank’s $12,500 commitment to give back to the Springfield area. Springfield Boys & Girls Club received the majority of the community vote and was presented with a $7,500 donation. Big Brothers Big Sisters of Hampden County and YMCA of Greater Springfield each received a $2,500 donation. The Community Bank N.A. Springfield branch began renovations in early October 2018 to add convenient features for customers. The branch will house nine team members and offer customers a wide range of services, including checking and savings accounts, commercial business, and mortgages. GILL — Travel Kuz, a motorcoach charter company based in Gill, sent six of its luxurious motorcoach buses to the Super Bowl for the second consecutive year. The Travel Kuz buses and drivers were used in Atlanta for VIP and dignitary transportation, which included the special guests of each team and the athletes’ families. In addition to last year’s Super Bowl LII in Minneapolis, Travel Kuz has also provided transportation services at Super Bowl XLI in Miami in 2007, and at the 2010 Olympic Winter Games in Vancouver, British Columbia. F.M. Kuzmeskus Inc., doing business as Travel Kuz, is a fifth-generation family business that has been providing school-bus and luxury motorcoach transportation for more than 90 years. The company operates more than 150 vehicles employing 136 local residents in Franklin County and Southern Vermont. LEE — MassDevelopment has issued a $2,646,000 tax-exempt bond on behalf of Patriot Armored Systems Holding LLC, a real-estate entity affiliated with glass manufacturer Patriot Armored Systems. Patriot Armored Systems currently leases 45,000 square feet of office and manufacturing space at 100 Valley St. in Lee. The company’s real-estate entity will use bond proceeds to buy the building and construct a 7,500-square-foot addition, allowing Patriot Armored Systems to expand its manufacturing operations and hire 13 additional employees. Berkshire Bank purchased the bond. Founded in 1992, Patriot Armored Systems manufactures laminated, customized protective glass systems by purchasing glass as a raw material and melding it with bonding compounds. The company specializes in bullet-resistant glass and security glazing and offers an array of glass types, including architectural, ballistic, and bullet-resistant glass. Patriot Armored Systems serves a broad customer base, manufacturing customized products for various military operations, law enforcement, government buildings, banks, hospitals, retail businesses, vehicles, and homes. HARTFORD, Conn. — United Financial Bancorp Inc., the holding company for United Bank, announced results for the quarter ended Dec. 31, 2018. The company reported net income of $12.2 million, or $0.24 per diluted share, for the quarter ended Dec. 31, 2018, compared to net income for the linked quarter of $16.3 million, or $0.32 per diluted share. The company reported net income of $9.5 million, or $0.19 per diluted share, for the quarter ended Dec. 31, 2017. Net income for the year ended Dec. 31, 2018 was $59.9 million, or $1.17 per diluted share, compared to net income of $54.6 million, or $1.07 per diluted share, for the year ended Dec. 31, 2017. “In the fourth quarter of 2018, United Financial Bancorp Inc. delivered annualized linked quarter loan growth of 9% and deposit growth of 12%, while maintaining pristine asset quality and a strong balance sheet,” said William Crawford, IV, CEO and president of the company and the bank. HADLEY — Pride Stores held a ribbon-cutting ceremony on Jan. 23 at its newest store, located at 25 Russell St. in Hadley. The new store offers a wide range of services, including an expanded dining area, a café and bakery, fresh deli and grill, Subway, a convenient drive-thru lane, as well as a separate room for beer and wine sales. It’s the first Pride to offer Chester’s Chicken for fresh fried chicken and family meals. The site also includes 12 charging stations for Tesla vehicles. Pride also donated five cents from every gallon of gasoline purchased that week to the Hadley Library Fund, a local nonprofit that is raising funds to support the building of the new Goodwin Library slated to break ground this summer. BOSTON — Homeowners, renters, and business owners across Massachusetts are always looking for ways to reduce expenses, and that includes energy costs. In recognition of its efforts to help these customers better manage their energy, Eversource was recognized by the American Council for an Energy-Efficient Economy (ACEEE) with Exemplary Energy Efficiency Program awards for both its Home Energy Services (HES) program and Franchise Customer Initiative in Massachusetts. The national award recognizes the best utility programs across the country. ACEEE’s national review evaluates and recognizes exemplary programs in areas such as direct customer energy savings, cost-effectiveness, customer service, innovation, and expansion potential. Eversource’s HES program takes a fuel-blind approach and provides in-home energy assessments, turnkey facilitation of weatherization measures, and 0% financing to help homeowners or renters retrofit their homes with cost-effective, energy-efficient measures. Since 2016, the energy saved through Eversource’s HES program in Massachusetts is enough to power approximately 6,000 homes for a year, and the greenhouse-gas emission reductions are equivalent to taking 1,062 cars off the road for a year. PITTSFIELD — Berkshire Theatre Group (BTG) announced it was the recipient of the Mass Cultural Council’s (MCC) Universal Participation (UP) Designation. The UP initiative seeks to break down barriers that prevent civic participation in the cultural sector of Massachusetts. The UP designation provides peer networking, leadership platforms, access to grants, promotional opportunities, and professional development for organizations demonstrating inclusive practices. Through the MCC Innovation and Learning Network and the UP designation, the goals of the UP initiative are to support the growth and development of organizations that embrace inclusivity as core to their mission and recognize the power of design to anticipate and accommodate patrons, staff, volunteers, and students. BTG received this designation through providing training to the staff, board, and volunteers about inclusion; engaging users and experts to steward institutional needs to facilitate program and policy development; and implementing innovative accessible practices. HOLYOKE — Hazen Paper Co. is sharing a futuristic view of holography with its 2019 calendar, titled “Space – the Infinite Frontier.” Hazen Holography creates the illusion of motion and dimension on two-dimensional printed items by reflecting and refracting light at different angles. Revolving around the design concept of concentric circles, the calendar depicts a view of space from within a space capsule and a rocket launch. The poster/calendar incorporates several new holographic effects, including circular pillars, which resemble a sun-like orb pulsating with prismatic color that appears concave or convex, depending upon the viewer’s perspective. It also features holographic radial burst, a ray of light beams that alternates from monochrome to a rainbow of colors. The 18-by-24-inch poster/calendar was created to showcase Hazen’s wide-format tableau. This capability enables production of materials up to 52 inches wide without recombine lines, providing designers greater creative freedom. The custom Hazen hologram on 10-point board, coated on both sides, was finished with four-color printing plus opaque white. Hazen is known for the holographic stadium edition NFL Super Bowl program and the holographic enshrinement yearbook for the Basketball Hall of Fame. It is the most vertically integrated producer of holographic paper and film in the U.S., with a holographic lab and design studio on its Holyoke manufacturing campus. To receive a calendar, e-mail [email protected] or call (413) 538-8040. BOSTON — Berkshire Hills Bancorp Inc. reported GAAP net income of $14 million, or $0.31 per common share, in the fourth quarter of 2018. The non-GAAP measure of core earnings totaled $29 million, or $0.63 per share, during this period. Both GAAP and core EPS totaled $0.70 in the prior quarter. The benefit of higher net interest income in the fourth quarter was offset by lower fee income and higher expense. Core EPS is net of non-core charges, which totaled $0.32 per share after tax in the fourth quarter and included merger-related expenses and other items, including costs related to the restructuring of the company’s banking systems provider relationships. Fourth-quarter financial highlights included 2% loan and deposit growth, 3.41% net interest margin, 60.3% efficiency ratio, 0.17% net loan charge-offs/average loans, and 0.28% non-performing assets/assets. “Core earnings for the year were in line with our original plan, and fourth quarter core earnings also met our expectations before the impact of the government shutdown on SBA-related fee revenue,” CEO Richard Marotta said. “During 2018, our teams made great strides integrating our Eastern Massachusetts acquisition and developing organic business across our footprint. Loan growth was consistent throughout the year, and deposit balances increased with the benefit of higher activity in the fourth quarter. Our internal capital generation supported our balance-sheet growth, and our credit performance and asset quality remain strong.” The board of directors voted to increase the quarterly cash dividend by $0.01, or 5%, to $0.23 per common share to shareholders of record at the close of business on Feb. 14, 2019, payable on Feb. 28, 2019. Effective on the same dates, the board also increased the quarterly cash dividend on preferred stock by 5% to $0.46 per share. SPRINGFIELD — Teach Western Mass has been awarded a $250,000 grant from the Barr Foundation that will allow the education nonprofit to make investments in strategic planning and capacity-building efforts. Launched in 2015, Teach Western Mass is a nonprofit organization focused on improving the volume, quality, and diversity of teacher candidates in Western Mass. Teach Western Mass (TWM) leads regional teacher-recruitment campaigns in collaboration with school and district partners. As a result, it is the primary source of job opportunities for prospective teachers in Western Mass., while also offering a high-quality, diverse talent pool for partner schools. In the last two years, TWM partner schools have accelerated hiring timelines and increased the percentage of incoming teachers who self-identify as people of color to 40%. Teach Western Mass also offers four innovative and regionally based teacher-training programs that seek to address persistent talent and hiring challenges faced by partner schools, which include both district and charter schools. SPRINGFIELD — Way Finders Inc. was awarded a two-year grant for $140,000 from Tufts Health Plan Foundation to advocate for equitable infrastructure and improved public safety in Springfield. This is one of 11 new community investments totaling more than $1.2 million that reflect the foundation’s commitment to advancing policies and practices that support healthy aging, including addressing gaps in oral health, nutrition, housing, transportation, and community safety. Through this grant, Way Finders will increase the capacity of low-income, older people who are advocating for policy and system changes in Springfield. These older people will lead efforts to address the built environment and community safety. The project leverages Way Finders’ existing Resident Health Advocate programming and its relationships with LiveWell Springfield and the Massachusetts Senior Action Coalition to enable the development of a robust advocacy infrastructure for the city. EASTHAMPTON — Effective Jan. 1, Smith Brothers Insurance, with offices in Easthampton and West Springfield, and the Partners Insurance Agency, an independent insurance agency located in Vestal, Owego, and Waverly, N.Y., have merged together. This merger expands the Smith Brothers Insurance footprint into upstate New York, where the Partners will maintain local presence while leveraging the resources of Smith Brothers Insurance, one of the nation’s top 100 independent brokers. Owners of the New York offices — Don Patterson, Bill Soprano, Phil Wiles, John Carlin, Michael Constantine, and Chris Hutchings — will stay fully engaged in client service and business development. Constantine will run the New York region, continuing to serve clients with the same team of insurance professionals who have also become employees of Smith Brothers Insurance. SPRINGFIELD — Florence Bank opened its second Hampden County branch at 1444 Allen St. in Springfield on Dec. 19. “We’re very pleased to be expanding our presence in Springfield,” said John Heaps Jr., Florence Bank’s president and CEO. “Our focus is on providing great customer service and helping to reinvigorate the community.” The Allen Street branch has an open floor plan with two teller pods and innovative technology for quick cash handling. The location will also feature a drive-up ATM with SMART technology for easy depositing and a comfortable waiting area inside with a coffee bar and free wi-fi. Nikki Gleason serves as branch manager for the new location. Other employees include Candice Somar, assistant branch manager; Bianca Hyde, customer service representative (CSR) and teller operations manager; Mario Nascimento, CSR and senior teller; Magdalis “Maggie” Sierra, CSR and senior teller; and Carolyn Ware, community relations director. In August 2017, Florence Bank opened its first branch in Hampden County at 1010 Union St. in West Springfield. The Springfield branch marks the second of several anticipated branches in the region, Heaps said. SPRINGFIELD — Western New England University (WNEU) announced plans for a comprehensive fundraising campaign designed to enrich the student experience inside and outside the classroom. Named the Campaign for Our Second Century, the philanthropic endeavor launched publicly on 1/9/19 — a nod to the university’s founding year of 1919. Western New England University aims to raise at least $35 million in private support for a range of priorities that will build on the institution’s historic first century and shape its future progress. Those priorities fit into five overall fundraising objectives: growing scholarship aid, building and enhancing campus facilities, creating impactful opportunities for student life, boosting academic initiatives and experiences, and strengthening the President’s Fund for Excellence. Current and future Western New England students will be the direct beneficiaries of the most ambitious fundraising effort in the university’s history. The number-one priority of the campaign is to increase student aid through donor-funded scholarships. In recent years, full-time undergraduate enrollment has grown to record levels, with more than 98% of students receiving financial aid through scholarships, grants, and loans. The university has already secured more than $29 million in new gifts and commitments to advance Western New England during the campaign’s pre-launch phase, which began in 2016. Lead gifts were made by two of the university’s most ardent supporters — Kevin Delbridge ’77 and Janet Johnson Bullard ’69, both university trustees who are serving as the campaign’s honorary chairpersons. To date, more than 4,000 individual alumni, friends, and foundations have made commitments. Each gift made to WNEU during the campaign counts toward its goal. This is Western New England’s second comprehensive campaign. Private philanthropic support is not intended to replace university sources of revenue, but rather provide the margin that enables greater access to scholarship support, state-of-the-art technologies, outside-the-classroom experiences, faculty development, and other critical learning services. For details about the Campaign for Our Second Century, visit wne.edu/campaign. MONSON — For the ninth year in a row, Monson Savings Bank asked the community to help plan the bank’s community giving activities by inviting people to vote for the organizations they would like the bank to support during 2019. The top vote getters include Wilbraham United Players, Scantic Valley YMCA, the Women’s Empowerment Scholarship Fund, Rick’s Place, River East School-to-Career, Greene Room Productions, Boy Scouts of Western Massachusetts, Link to Libraries, Junior Achievement of Western Massachusetts, and Old Post Orchestra. LUDLOW — HealthSouth Rehabilitation Hospital of Western Massachusetts has unveiled its new name and brand as part of its management company’s name change and rebranding initiative. As of Jan. 1, the inpatient rehabilitation hospital is known as Encompass Health Rehabilitation Hospital of Western Massachusetts. It will continue to provide the same post-acute care for patients overcoming a variety of major illnesses and injuries. Birmingham, Ala.-based HealthSouth Corp. launched its new name and brand on Jan. 1, 2018 and will be transitioning its 130 inpatient rehabilitation hospitals and 273 home-health and hospice locations serving 36 states and Puerto Rico through 2019. All of the company’s post-acute-care service locations in Massachusetts migrated to the Encompass Health name and branding last week. HADLEY — The Advocacy Network, a local organization with a mission to promote and protect the health, human rights, and safety of people with developmental disabilities, recently donated $17,000 to Whole Children. The donation was one of the last acts of the group, which announced it is dissolving after more than 60 years of work. The late Benjamin Ricci, an Advocacy Network member, was the father of Belchertown State School patient Robert Ricci. He filed a class-action lawsuit against the school in 1972, claiming that its residents were living in horrific conditions. The judge assigned to the Belchertown case, Joseph Tauro, who died in November, spearheaded a major overhaul of Massachusetts’ state facilities as a result of the lawsuit, which ultimately ended in the closing of the institution. Amherst resident Bob Ricci, the man named in the lawsuit against Belchertown, came to Whole Children with members of the Advocacy Network to deliver the check to director Maggie Rice. Whole Children was started in 2004 by a group of parents looking for after-school programs for their children with intellectual disabilities or autism. It joined with Springfield-based Pathlight in 2010 and has expanded to serve some 600 adults, teens, and children each year in a variety of recreation, performing-arts, and enrichment programs. AGAWAM — The statistics are alarming: 70% of Americans are living paycheck to paycheck. At work, stress over finances can take a toll on employee performance and impact productivity. Almost 10 years ago, OMG Inc. saw this as a factor limiting employee success and took action. OMG used SmartDollar, the financial-wellness program created by money expert and best-selling author Dave Ramsey, to teach employees how to take better care of themselves financially. More than 300 employees have taken advantage of the program to create a financial plan for themselves and their families. Using SmartDollar, the average OMG participant has paid off more than $8,000 in debt and saves more than $5,000. Collectively, participants have achieved a positive swing of almost $1 million through debt reduction and savings contributions. As a result, SmartDollar recognized OMG as its 2018 Company of the Year. HOLYOKE — The state’s third annual Manufacturing Award Ceremony, sponsored by the Legislature’s Manufacturing Caucus, was recently held at the State House in Boston. Hazen Paper was one of 58 manufacturers recognized for their success. Hazen is known worldwide for its holographic paper and manufacturing in Holyoke. Well-known examples its work include the Stadium Edition Super Bowl Program and the Basketball Hall of Fame Enshrinement Yearbook. Hazen started an apprentice program in 2007 to train the expert workers required for this high-tech factory. Hazen has hired and trained more than 50 apprentices in the last 10 years. In 2010, Hazen started an internship program with engineering students from Western New England University, several of whom now work full-time on the Hazen management team. Hazen has been proactive in helping to build the future workforce via the World Is Our Classroom program, whereby every fifth-grader in Holyoke public schools visits Hazen for a full day of teaching and tours. Hazen started the program in 2004, and an estimated 4,000 fifth-graders have participated since that time. AGAWAM — Big Y Foods Inc. of Springfield and COCC of Southington, Conn. have been selected by the Employers Assoc. of the NorthEast (EANE) as Employer of Choice Award recipients for 2018. Employer of Choice awards recognize companies and organizations for developing workplaces that value employees, foster engagement, invest in employee development, and reward performance. Doing business for over 80 years, Big Y Foods is a family-owned supermarket chain with more than 11,000 employees throughout Massachusetts and Connecticut. The chain prides itself on a culture of caring, which manifests itself in the form of workplace ‘huddles’ to celebrate employees who have gone above and beyond, and through the organization’s strong commitment to retain employees. Big Y stands out for its overall benefits, employee satisfaction, training and development, and recognition and rewards. One novel program, called Building Firm Foundations, is a collaboration in which employees help other employees with home-repair needs by utilizing their skills, expertise, and time. Projects have included building ramps, fixing decks and windows, landscaping, and more. Another initiative, called the 10 Foot Rule, combines a user-friendly customer-service model with a fun graphic reinforcing how to treat customers. The Big Y University and Big Y LIFE, an internal communication portal, are among the other employee-centric engagement offerings. HOLYOKE — Comcast recently staged a ribbon-cutting ceremony to celebrate the grand opening of its newest Xfinity Store, which is located on the upper level of the Holyoke Mall. The 4,691-square-foot space is the first Xfinity Store in the region to open in a mall setting. Consumers will have the opportunity to explore, learn about, and interact directly with the latest Xfinity products and services, including Xfinity Mobile. In addition, the store offers a dedicated space where Comcast Business customers and prospects can discover cutting-edge business solutions and get connected with a local expert to discuss their business technology needs. Local officials and community leaders, including Holyoke Mayor Alex Morse, state Rep. Aaron Vega, City Council President Todd McGee, Ward 3 City Councilor David Bartley, Ward 2 City Councilor Nelson Roman, and Greater Holyoke Chamber of Commerce President Barry Feingold, came out to celebrate the grand opening and tour the new store. LONGMEADOW — According to the Bureau of Labor Statistics, healthcare occupations will add more new jobs than any other occupational group in the next decade, projecting overall growth of 18% by 2026. The American Women’s College at Bay Path University prepares graduates to help meet that growing demand with its online bachelor of science in health service administration program, which has just been recognized on a list of the 30 best in the nation by TheBestSchools.org. The site formulates rankings based on six informational categories: academic excellence, strength of faculty scholarship, reputation, financial aid, range of degree programs, and strength of online instruction methodology. The university’s degree program ranked 18th on the list. The American Women’s College’s digitally enhanced learning model, SOUL (Social Online Universal Learning), uses data-driven intervention strategies to help mitigate achievement gaps, and has been recognized with more than $5 million in support from industry thought leaders and organizations, as well as awards from national foundations, the federal government, and awarding agencies. SPRINGFIELD — The team at Burkhart Pizzanelli, P.C. is doing its part to spread warmth to more than 250 children in need of winter coats this season. The local accounting firm organized a campaign through Operation Warm to purchase the new coats for children served by Square One. They were delivered to Square One on Dec. 4. “Being a strong community partner is an intergral part of our culture at the firm,” said Julie Quink, managing principal at Burkhart Pizzanelli. “As part of our commitment to the community that we work and live in, we believe giving back is important. Many of our clients share the same philosophy and joined our efforts, for which we are very appreciative. Partnering with Operation Warm to provide brand-new winter coats for the families served by Square One is one way for us to make a small difference in our community. We believe that all children should have opportunities to grow without worry.” Added Kristine Allard, chief Development & Communications officer for Square One, “to be able to provide our children with beautiful, brand-new winter coats does wonders for them. Not only does it help to protect them from the elements, but having a new coat of their own builds confidence and self-esteem.” Operation Warm is a national organization that provides new winter coats to children in need, helping to improve self-confidence, peer acceptance, school attendance, and overall wellness. Funding support comes from businesses and individuals within the communities they serve. HOLYOKE — Parents at the Boys & Girls Club of Greater Holyoke agree that having reliable transportation is the biggest challenge to their children’s participation in after-school activities in Holyoke. Lack of reliable transportation is even more of a stressor for low-income families in need. With that in mind, Bridgestone Retail Operations (BSRO) surprised youth at the Boys & Girls Club of Greater Holyoke with a brand-new, eight-passenger Toyota Sienna van, valued at $35,000. The van was recently presented by Joe DeAngelis, New England Region manager, and Scott Zimmerman, area manager for Bridgestone Retail Operations, to Eileen Cavanaugh, president and CEO of the Boys & Girls Club. The club will utilize the van to engage in experiential learning opportunities, take youth on field trips, visit colleges, increase volunteer opportunities for teens, and participate in more career-readiness activities. In addition to these benefits, the four satellite units located within Holyoke Housing Authority communities will now have more access to the main club. The van allows transportation to nearly 1,400 club members to and from the club.